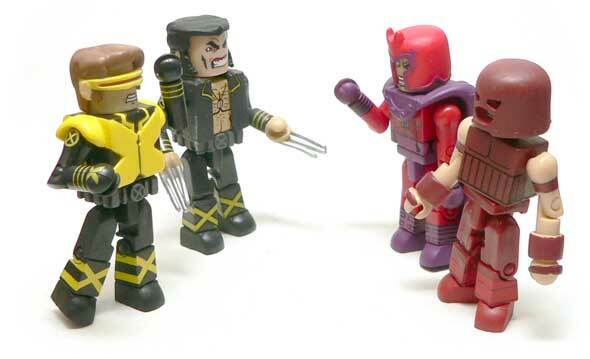 Last time I reviewed Cyclops & Juggernaut. 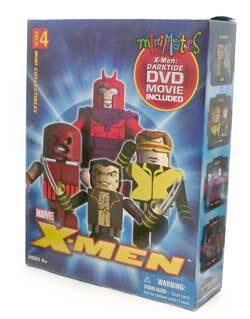 This time I’m taking a look at the other half of the X-men: Darktide Marvel Minimates 4-pack, Logan and Magneto. I thought it was an appropriate pairing, since these two have had their clashes over the years. I’m calling him Logan here because thats what the package calls him. Some of you may know him better as Wolverine. Same character, however, I normally think of the unmasked, non-spandex costume version as Logan. Use your judgement, your mileage may vary. I should have mentioned this pairing could have been some kind of tooth whitening competition set. Logan’s got his lips pulled back so far you can see his upper gum line. To me this is just a little frightening. Of course, those choppers are framed by his trademarked sideburns. One thing I was a little let down with was the hair. It doesn’t seem as “pointy” as it should be. Even the movie versions were quite the flattop that this guy has. The body is typical bare chested Logan with a leather coat. Stylistically, he’s very similar to the Cyclops in the set. However, he lacks the big yellow X and that is just fine by me. He does have X’s on his shins and shoulders, but they aren’t nearly as overpowering as Cyc’s. Now, onto the arms. There’s no extra hands with this set, so you pretty much only get the claws out look with this guy. Here’s the thing I don’t understand. 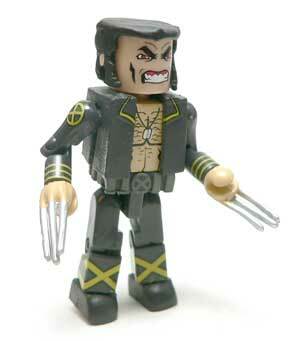 And it’s a problem with a number of Wolvie figures over the years. I don’t understand the mechanics that would allow Logan to have open grasping hands and claws out. Of course, I don’t have knives in my forearms either. In this case makes the blades look like they are attached to the back of hands. 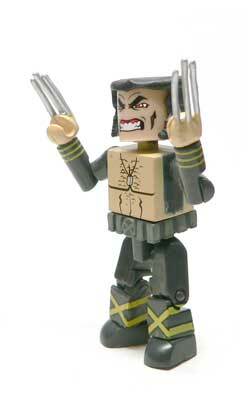 The mold lines and flash are a little heavier on these hands than any of the other Minimates that I have. They just look cheaper. Also, the peg on the left hand is too small and keeps falling out of his arm. 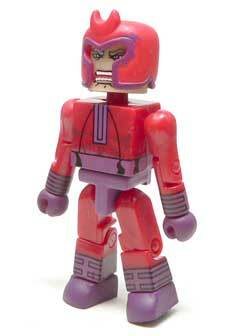 Magneto is one of those characters whose looks have changed to suit story arcs over the years. He seems pretty ripped for a guy that is supposedly as old as him. Maybe it’s mutant tiger blood. 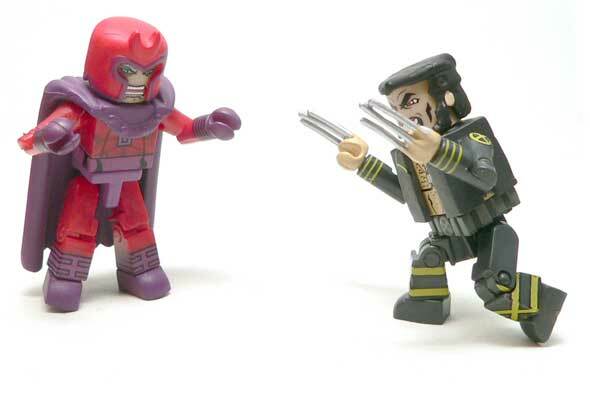 Where a the rest of the figures in this set seem to be a more modern style, Magento seems to be more of a classic style. I think it is probably all the line work on the wrists and shins that gives me this opinion, but he really has more of that old school comic book feel to me. 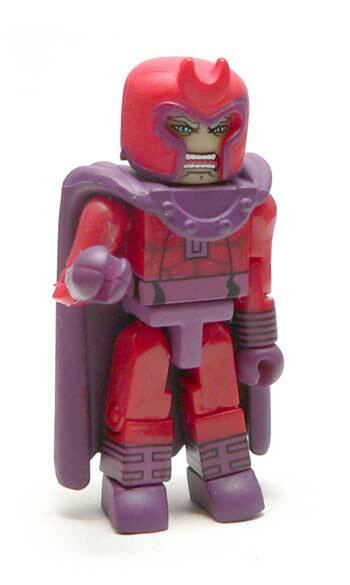 Magneto has a couple of special pieces, the first being his cape. The piece has the bolted collar look that we are use to seeing on the Master of Magnetism. However, it doesn’t stand out real well since there’s no paint on the piece. The second special piece is Magneto’s helmet. The little flares around the eye holes also give that 80’s vibe. The paint on this piece is somewhat disappointing. The purple around the eyes has a bit of slop and none of the purple lines are real crisp. The bigger issue is the color of the red. The piece appears to be colored using a bright red that I thought was reserved for fishing lures. This red doesn’t match the body at all, and if it wasn’t for the purple cape, the difference would be jarring. For the price I paid, I’m not all that disappointed with this set. Three of these figure are probably not the best versions of their characters, but do well enough. Juggernaut is the real stand out of the set. However, if you wanted a good start set of X characters the set brings that. Immediate desktop battles can ensue straight out of the box, and that’s pretty cool. Throw in a DVD and the value isn’t too bad. I forgot to mention that there’s no hair painted under Magneto’s helmet. He’s just an angry bald dude. As a whole, this is a very nice set. The figures I liked most were, well, everyone except Juggernaut. He really needs some more bulk.